Power Tex India scheme was launched by Union Textiles minister Smriti Zubin Irani at Bhiwandi in Maharastra, Erode in Tamil Nadu and also in all power loom sector across the country on April 3rd, 2017. This scheme will be active for a period of three years until March 2020. It will hugely benefit the small power loom weavers for their survival. To upgrade the power loom sector of our country, the government has increased the subsidy by 30%. Power looms using solar power plants will be granted 50% subsidy. SIMA (South India Mills Association) Chairman M. Senthil Kumar said that the power loom sector has been facing numerous challenges due to sluggish global and domestic market condition. This scheme would give great relief to all the states of India, especially Maharastra and Tamil Nadu that accounts over 75 % of power loom of the country. It has overall nine major components, including two new schemes. In-situ upgradation scheme of Plain Power looms: for improving productivity and quality of fabrics it will Provides subsidy to financially weak power loom unit owners for upgradation of looms. Group Work shed Scheme (GWS): It Provides subsidy for construction of work sheds for shutter less looms for better working conditions. Yarn Bank Scheme: it will provide Interest-Free corpus fund to Special Purpose Vehicle (SPV) or Consortium to purchase yarn at wholesale price. Common Facility Centre: to setup Common Facility Centre having pre-weaving and post-weaving facilities, Government of India will provide Rs. 2 crore subsidy . Other components are Facilitation, IT, Awareness, Market Development and Publicity for Powerloom Schemes, Tax Venture Capital Fund , Modernisation & Upgradation of Powerloom Service Centres (PSCs). The main Objective of In-Situ Up-Gradation component is to benefit the economically weaker low-end power loom units by providing them financial assistance. Group Workshed scheme will benefit all power loom units having up to 8 looms. Under Yarn Bank Scheme Yarn will be purchased at the wholesale rate and it will be sold to small weavers at a reasonable price, which will cut-off middle man supplier’s brokerage charge on sales of yarn. Pradhan Mantri Credit Scheme will provide Loan Facility under Pradhan Mantri Mudra Yojana to power loom units which are decentralized. Solar Energy Scheme provides financial assistance for the installation of solar photo voltaic plants to alleviate the power cut problems. 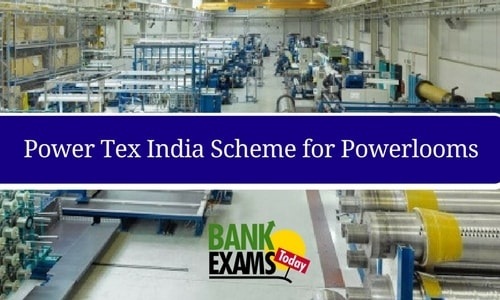 1. Who Launched the Power India Tex Scheme? 2. Which two states will be mainly benefitted under this scheme? 3. Who is the present chairman of SIMA (South India Mills Association)? 4. What is the validity period of this scheme? 1. Union Textiles minister Smriti Zubin Irani. 2. Maharastra and Tamil Nadu. 4. From April 2017 till March 2020 (Three years).